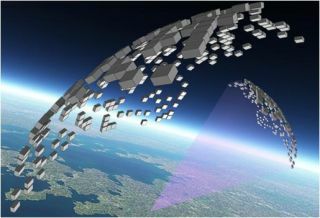 An artist's depiction of what a swarm of chip-sized satellites might look like. Three tiny satellites, each the size of only a cracker, will launch with the space shuttle Endeavour on NASA's next-to-last shuttle mission, scheduled to begin tomorrow (April 29). Such devices, which can be made even smaller, could transform future space exploration and the cost of launching satellites. Since the cost of spaceflight remains astronomically high, at thousands of dollars per pound, researchers have explored increasingly smaller orbiters, down to "nanosatellites" such as CubeSats that measure about 4 inches (10 centimeters) across and weigh a mere 2.2 pounds (1 kilogram) on Earth. The next logical step? "We are working on a satellite on a chip — satellites the size of a fingernail," said researcher Mason Peck, an aerospace engineer and futurist at Cornell University. "Instead of a spaceship, think of a 'space-chip.'" These penny-size orbiters could pack sensors, a microchip brain and an antenna to broadcast their findings. In terms of propulsion, they could use their entire surface to reflect light in the manner of a solar sail, and vaporize extraordinarily thin films of material to rotate. Although each satellite-on-a-chip might not be able to do much on its own, Peck said that if each weighed about one-tenth of a gram, that would amount to 10,000 per kilogram ? or 10 million per metric ton (2,200 pounds), enough to spread a swarm of penny-size satellites over the Earth, scanning the planet for roughly the equivalent price of one large satellite. "I believe this satellite-on-chip idea is transformative — it forces a rethink of how one does space exploration," Peck told SPACE.com. Satellite-on-a-chip designs. The one on the far left is a prototype scheduled to fly soon on the International Space Station. They each contain seven solar cells, a microprocessor, an antenna and amplifier, power storage in capacitors, and switching circuitry to turn on the microprocessor when the stored energy is enough to create a single radio-frequency emission — a digital beep, Peck said. "The time between beeps is related to the sun's angle of incidence on the chip, so this spacing will tell us the chip's orientation relative to the sun," Peck said. Optimized versions of these devices would just be about 10 to 50 milligrams, 0.5 inches by 0.5 inches (1.4 cm by 1.4 cm) large and 20 microns thick — "at that thickness, they act as respectable solar sails," Peck said. A potential satellite-on-a-chip alongside a dime. The prototypes are mounted on a pallet that Endeavour's STS-134 astronauts will bring to the International Space Station. "They will be exposed to the space environment for a long time — we will learn how well these particular components survive," Peck said. "A more fundamental objective is for us to detect the 902-megahertz radio frequency pulse on the ground. These signals are so weak, only 7 percent as strong as the background noise itself, that we have to use some very special signal-processing techniques to detect it. So, if we do detect that emission, we will have confirmation that the overall architecture — power, processing, communications, etc. — works." "Since there are three, all transmitting at the same frequency, we will also confirm that it's possible to discriminate among the three uniquely," Peck said. "That ought to be possible, in theory, because these digital beeps are 'mathematically orthogonal' — they are unique in a way that allows one to be seen despite the presence of the others." One concern about these satellites is whether they would pose a danger to larger satellites. Objects in low-Earth orbit are typically moving at nearly 17,000 mph (27,000 kilometers per hour), and even tiny bits of space debris can wreak havoc. Addressing these fears, Peck noted that the miniature satellites would be deployed in very low orbit, just 180 to 250 miles (300 to 400 kilometers) above the Earth. The planet's atmosphere at that altitude is tenuous, but still enough to start dragging the penny-size orbiters down virtually immediately, Peck said. Intriguingly, since these satellites are so tiny, atmospheric drag would quickly decelerate them to speeds less than the speed of sound. This slow re-entry means they effectively would flutter all the way down, avoiding the friction that spectacularly turns larger meteoroids into shooting stars. As such, a satellite-on-a-chip could observe a target or sample the uppermost atmosphere throughout its descent — "Earth's, or that of Venus, Titan, Europa, Jupiter," Peck said. "It's not about reducing cost, although that may be a nice benefit," Peck said. "Instead, we are re-conceiving spacecraft architectures and exploration missions for this tiny scale. The way tiny spacecraft work is radically different from how larger ones work, and it's even qualitatively different from how CubeSats or smartphone-size satellites work." Follow SPACE.com contributor Charles Q. Choi on Twitter @cqchoi. Visit SPACE.com for complete coverage of Endeavour's final mission STS-134 or follow us @Spacedotcom and on Facebook.